BSCAN is the on-going survey of B Series banknote prefixes. The goal is to fill in the missing gaps in recorded prefix information. We believe that the series ends with GKG. Has anyone got a note with a later prefix? 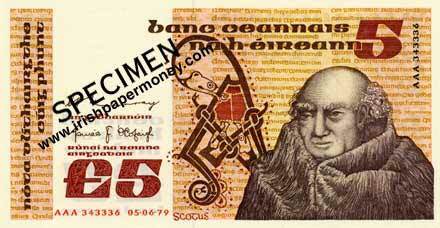 Central Bank of Ireland Five Pounds, featuring Scotus. 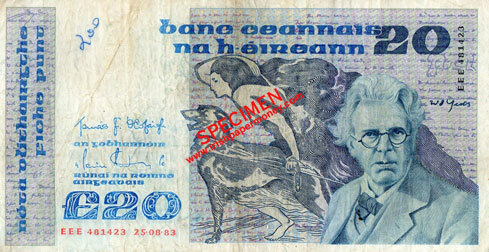 Central Bank of Ireland 10 Pounds, featuring Swift. 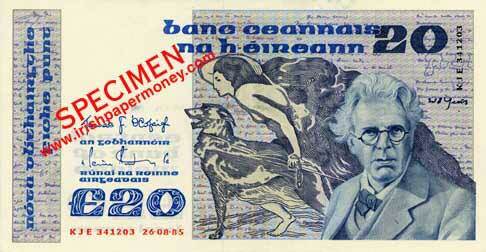 Central Bank of Ireland 20 Pounds, featuring Yeats. I used to find it odd that the B series used a 3 letter code cypher. The first letter being the 12 Million A to L notes printed. Then the second letter being the date. Usually 12 Million notes were printed on a given date, unless it was the Pound notes, where the demand and requirements were MUCH higher. It also 'skipped' in a random way. For example, on the last year I followed and tracked it, the Fiver from 07.05.93 (The last date) goes AKG then the next sequence back three letters AHG then AEG. Odd that. You raise an interesting point. I'll have to dig out my original article on this and post it. The sequence of the middle letter is actually quite logical. 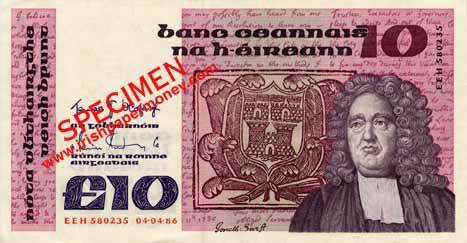 It took me a while, but I worked all the sequences out back around 1996 when I was doing a book on Irish Banknotes, with the help of a friend who had been recording notes before I started. Basically it is as follows below. The progression of a sequence is alphabetical, usually skipping one or two letters before using the next letter. When the sequence reaches L, it recommences at A again until all of the letters are used. Letters are not reused, and an extra letter will be skipped until the sequence falls on unused letter. Some of the sequences run backwards. Generally remains the same until all sequences are complete, i.e, all letters A to L in the sequence are used up. SEQUENCE LETTER: Second, middle, letter. This changes almost always with each date of issue. Generally runs A to L for a sequence, giving up to 12,000,000 notes for each sequence. Sometimes a sequence will adjust by skipping one or no letters so that the letter A may be used next. The base letter is also generally used to decide the replacement note identifier. There are anomalies, where bits of sequences are missing, and where left over prefixes are used on other denominations. Base letter µµB. Replacement BBB. Thus, we have: ALB-LLB (first date, 10.06.77); AIB-LIB (second date, 27.06.77); AFB-LFB (third date, 20.09.77) etc. E (FG) H (IJ) K, backwards gives you K, H, G for the middle letters. So you have AKG, AHG, AEG. Tracking down prefixes on a series that was withdrawn over 20 years previously can be a slow task. Still, the occasional gap is filled as time goes on. £20 prefix KKE found, for both 11.07.83 and 28.10.81. 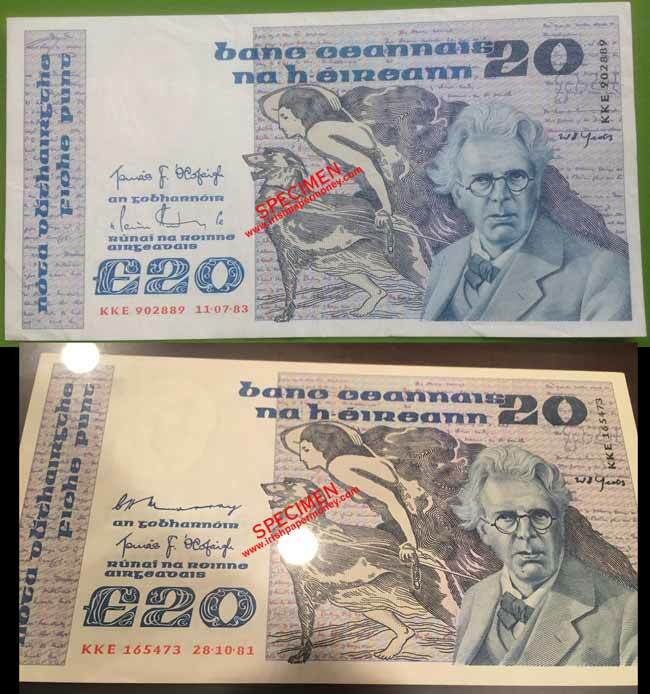 Thanks to an eagle-eyed viewer for emailing me an image of the 28.10.81 banknote. This confirms the record of 25 years ago, which unfortunately didn't include images! Pre-web or smartphone instant pic days. £10 FDH reported by a forum visitor. Today I saw a £20 replacement note, EEE prefix, date 25.08.83. Did you already have it in the census? SN was 481423. Can you post a pic of the EEE replacement note, or email it to me please. Hi, I sent the email. Did you receive it? I'll post the pic shortly.